Dinner dates with strangers; excursions to inspect chewing gum stuck on waterpipes in back alleys; groups gathered to cross the road together; chance conversations on street corners: these are among the marginal, largely invisible activities which constitute the current project of the League of Resonance. The working methods which underlie a project like this are not widely understood. This is hardly surprising – the artists of the League employ a set of processes which are still relatively novel additions to the toolbox of contemporary art. Artists have worked in this way before. In the 1970s, conceptual and performance artists pushed against the constraints of gallery and theatre architecture, creating situations which paralleled everyday life, or wove themselves within it. In the late 1990s, Nicolas Bourriaud described the rise of “relational” art practices which utilise “meetings, encounters, events, various types of collaboration between people” as the material and medium (and not just the byproduct) of art.1 Others prefer the terms “new genre public art”, “dialogical art” and “collaborative artistic praxis” for projects which attempt to operate within, or create new versions of, the public sphere.2 Politically progressive artists and institutions are often drawn to such approaches, as they seem to offer a softer alternative to the authoritarian tradition of heavy-object public “plop” art. For those interested in shifting art’s role towards ethical social transformation (rather than merely operating as a realm of high cultural prestige-enhancement) this new set of “socially engaged” aesthetic processes might suggest a grassroots, democratic way of intervening in the life of a city. It’s perhaps such quasi-utopian ideals that have emboldened the City of Melbourne to initiate this strange project on the corner of Elizabeth and Flinders Streets. For this project the Arts and Participation program have departed from a more traditional method of arms length ‘commissioning’ and explored an approach where the production of the work is a collaborative exchange between the artists, the site and the public institution. The city council should be congratulated for taking this risk, when they could easily have chosen a more conventional approach with predictable outcomes. In speculative endeavours like the League’s, the unknown is never far away. But for a council-sized organisation, risks need to be mitigated; plans known in advance; outcomes predicted. Progressive policy and artistic ideals must be balanced with a responsibility to produce safe, quality projects within legislative requirements. This complex interplay of freedoms and restraints often characterises public projects as they flow along. How should such dilemmas be navigated? In this essay, I’d like to describe, as best I understand it, the way that a project like this unfolds over time. The League’s processes stand as a case study in situated, process-based art – and since my motivation is to encourage councils and other organisations to continue commissioning such work, I want to try and sketch out the methods which they have used, and the underlying rationale for working in such a way. I will attempt to get at some of the challenges that this way of working throws up – including the thorny questions of aesthetic autonomy, and the evaluation of outcomes. 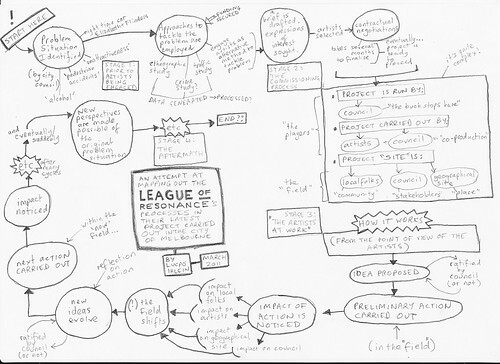 I hope that this methodological inspection of the processes of the League of Resonance will help outline the beginnings of a framework so that artists and commissioning bodies might have a more nuanced understanding of each other in future collaborations. Because of the complexity of the process, I’ve tried to lay it out in a diagram, which begins long before the project is initiated, and ends… well, perhaps never. Here’s the basic sequence: First, a “problem situation” is defined by the city council. In this case, it’s the particular piece of land at the junction of Elizabeth and Flinders Streets. The site’s “problems” include its perceived visual unattractiveness, as well as an unacceptably high number of pedestrian accidents and nocturnal anti-social activity, largely due to excess alcohol consumption. (The members of the League, putting this into their own terms, describe it as the site’s “bad vibes”). The location is thus earmarked for further study. Funding is secured, and diverse approaches are mooted. These include a traffic survey (undertaken by Vic Roads); ethnographic research to discover the prevailing uses and perceptions of the site; and a proposal to develop an art project. The City of Melbourne’s Art and Participation Program argues that an artistic, collaborative approach might offer a depth of research not available to the more conventional methods described above. The process of engaging artists takes some time. Through a limited ‘expression of interest’ process, a collection of project proposals is reviewed and one is selected in keeping with a published set of evaluation criteria. The Art and Participation Program “values excellence and innovation in art making” and “high artistic integrity”. However, criteria for evaluating excellence, innovation and integrity are difficult to explicitly describe — I will return to these issues later on. The brief accompanying the call for expressions of interest is quite complex: “The City of Melbourne’s Art and Participation Program uses art to engage with communities and influence the development of the city’s culture.” It involves appointing artists “as an alternative method for Council to engage with the city at night and explore and interpret perceptions and realities of the night experience.” These statements evoke the instrumental use of art as a tool of social change, and from an artistic point of view, this raises doubts about the potential ‘autonomy’ of any resulting project. The initial proposal that the Arts and Participation Program selected for the intersection was based around an interactive sound installation that later evolved into The League of Resonance. The project was selected on the strength of its proposal to “develop and deliver a work that is informed by the community and stakeholders of the site […] activating the space with positivity, romance and humour”. How will it do this? Precisely by the three core members of the League of Resonance spending many long hours on site, engaging in chance encounters with passersby, residents and workers, and allowing whatever happens to evolve from these encounters. The sorts of social skills which are deployed in this method of relational art include wit, patience, and conversation, accompanied by the careful crafting of body language and attentive listening. In the case of Jess Olivieri, Sarah Rodigari, and Jason Maling, such competencies have been acquired over many years of performative art practice. Appropriate to the carrying out of the project brief, these now take the place of more traditional artmaking methods such as painting and drawing. By the time the artists actually begin work on site, many months have passed in negotiations with council. One challenge, when contracting a process-based artwork, is in the clear representation of the aims of all parties involved. A ‘contract’ provides a framework for the negotiations, and attempts to mediate a common ground between expectations, adaptability and outcomes. From the council’s perspective, the contract needs to reflect its aspirations, and ensure that the resources being provided are allocated and utilised in line with its institutional obligations. The artists, for their part, must ensure that the contract reflects a realistic degree of creative ‘capacity’ or room to move – however, the nature of responsive art practices can make it impossible to guarantee specific outcomes. The ‘work’ has yet to reveal itself, and at the contract stage it is often only a set of proposed strategies. The way that the Art and Participation Program have chosen to work in this case, is by collaborating with the artists, rather than operating at arm’s length. This unique contractual stipulation does not mean that each activity the League wishes to incorporate into the project needs to be discussed and approved in advance – but nor does it mean that the council simply rubber-stamps every idea the League proposes. The process is more difficult – working towards shared goals through discussion and negotiation. While this is a laudable approach, consensus is by no means a guaranteed outcome – and for the artists, this deliberative process can be a challenge to long-held ideas about “creative autonomy”. What, then, could be the eventual shape that the project takes? At the very least, what emerges is a changed perspective of the original problem situation. The “bad vibes” of the corner of Elizabeth and Flinders are seen in a new light, (or, to use the language of the League of Resonance, these vibes are heard and felt in a new way.) Whatever this new perspective might be (and at the time of writing, the project is still too much in progress to know) it is only intelligible by understanding the processes that have gone into its generation. In other words, the “findings” of the project cannot be separated from its idiosyncratic “research methods”. If it’s true that the “behind-the-scenes” collaboration with the council forms a large part of the project, then I could perhaps expand the League’s list of artistic competencies to include: the ability to communicate at a bureaucratic or “professional” level; the negotiation of satisfactory deals, and the focus of mind to read and write lengthy contracts. As I’ve already suggested, such a multi-headed approach to artmaking – art by committee, if you like – throws into doubt the much prized romantic idea that artists are creative practitioners who operate with unfettered “freedom”. Is this a problem? Only if the myth of unmediated artistic autonomy is perpetuated in relation to the activities being carried out in the streets, and in the City of Melbourne offices – and only if these actual methods of production are swept under the carpet. To me this obfuscation would represent a significant missed opportunity. For the artists, the project has provided the chance to participate, at a high level, in the complex processes of deliberative decision-making that our system of representational democracy has yet to exceed. For employees of the council, collaborating with artists offers the means to reflect on the possibilities and limitations of its own processes – to really feel the friction that is generated when spontaneous ideas and legal regulations rub against each other. These challenges are not irritations or blockages to the process of artmaking – they are a vital part of it. First, by the quality of experiences generated near the corner of Elizabeth and Flinders Streets. Are they delightful? Horrid? Irksome? Do they shift my consciousness of the ordinary? And how can I know the answer to these questions, except via direct experience? Second, via the documents left behind (or fabricated) from these experiences. Do they evoke (what we imagine to be) the “vibe” of the original project? Do they have aesthetic (formal, material) qualities in their own right which make them an integral part of the project? Do they bring the project to life again, even long after (or far away from) where it began? Third, we might judge the quality of the project by the transformations it has made “in the field”. What sorts of new relationships have been formed? What new habits created? Do locals, artists and council employees have a new perspective on the original problem situation? Finally, from the point of view of relational art practices, I think it’s important to appraise the project based on the potential, upon reflection, for a deeper understanding of the processes essential to the work itself. Do artists, council employees and locals have a new grasp on how these kinds of projects operate? Can they identify the anatomy of interaction which goes into its making? How would the players embark on another, similar venture in the future? In other words: what has been learned from this experience? Lucas Ihlein is an artist who has for over a decade initiated and collaborated in socially engaged art projects. His Ph.D, entitled Framing Everyday Experience: Blogging as Art, deals with the ethics and aesthetics of locally-situated relational art practice. For his research in this area, he was awarded the 2010 Alfred Deakin Medal for best doctoral thesis in the humanities, by Deakin University, Melbourne. He lives in Sydney and lectures in Media Arts at the University of Wollongong. For those wishing to explore this subject further, related texts by Ihlein include: “Complexity, Aesthetics and Gentrification: The Redfern/Waterloo Tour of Beauty”, in There Goes The Neighbourhood, edited by Keg de Souza and Zanny Begg, You are Here, Sydney, 2009; and “Public Art as Public Conversations”, in Harmonic Tremors: Aesthetic Interventions in the Public Sphere, edited by Sarah Rainbird, Gasworks, Melbourne, 2009. This entry was posted in collaboration, Relational Aesthetics, writing by me on May 18, 2011 by Lucas. after reading that Kwon essay for an artwork last year, I have found it more difficult to do work like this (even though i’m heading back to melbourne in september to do just that). one of the main threads i got from that essay was a (valid)criticism of the place of art to glean from the public in that way – that the public become mere fodder for art and that what art gives back isn’t really equivalent, or in fact that useful. i’m not sure i wholeheartedly agree, but it has stopped me in my tracks a little again. i do, however, find it very interesting to note how city of melbourne have come to the party on working with artists in this way. i’m a bit bummed i didn’t know more about the project at the time (i think i was still in town then), but i’m slowly trawling back through copies of their publication. great diagram, lucas. as usual. Amy Spiers has written a thoughtful response to the League of Resonance Project, in which she (as a participant in the project) questions the efficacy of this form of open-arms sociability-as-art. Perhaps we just need to engage people with greater sophistication and thematise these problems in the work – allowing for disconnection, fragmentation, friction and lack of interest to have an impact on the outcome.